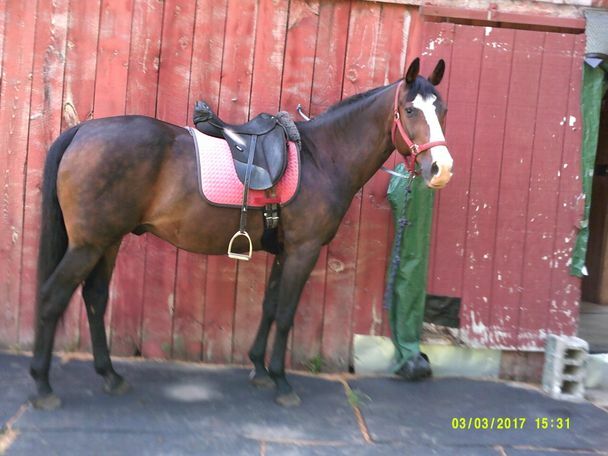 15.3hh gelding. 1,00lbs. No: Vices, Health or Hoof issues. Behavior issues. or lack of brain power. Excellent disposition. Good for Trims [ goes barefoot & has boots for rough terrain], and vet. UTD everything with records. Attentive, responsive to voice commands and leg aides. Good in traffic. Lunges. Goes Western or English- direct or neck reins. Amazing horse. Selling due to diminishing places to ride and death of his companion donkey. All  blankets, clippers, brushes, fly sheet & sprays. halters, leads, etc. go with Casey. Knowledgable, Good Home Only.